Without A Mailing List Youre An Online Disaster! They Will Never Get That Credit Card Out to Buy! Dont waste time with trendy theories about the new SEO and Web 2.0! Get back to basics and create your own double opt-in mailing list and do it in less than one month! Create an avalanche of profits using the PROVEN email marketing methods that are still secretly used by the best marketing gurus in the business! Read How In My New EBook! These email marketing strategies can cause your site to become so busy that your server will to shut you down so make sure that BEFORE deploy the techniques in Pumping Out Your First Email List you warn your webhost you are about to go on a big email outreach campaign! If you are involved in just about any type of internet commerce then one of the first rules of the game is to build an email list. If you dont have one and are an inspiring internet entrepreneur then you are drifting in a canoe without a paddle. You get a wonderful idea for an online business that could not fail to succeed! You spend hours and hours doing market research on your business to attract the right targeted customers! Why so many marketers and online business people actually manage to mess up a concept as simple as sending a message to people who want to buy from you. Although all of the how-to information that I have described above might sound theoretical I assure you that it is not. In fact I wrote this Pumping Out Your First Email List so that you do not have to know a single thing about marketing to make the principles in it really work for you. Build Your Business Plus Email List From Scratch Without Knowing a Single Thing About Internet Marketing! What to do if the domain name that you want has already been taken! What is a squeeze page and how you create one! How to create an entire eBook using other peoples free ezine articles without getting into trouble for plagiarism! So why have you not been hearing all about email marketing much these days? Here is a collection of reasons that internet marketing gurus have been using discourage you from becoming an email marketer (the shortest route to success) and encouraging you to use methods like SEO and Google Ads to attract traffic. Firewalls on many peoples computers prevent them from seeing your emails so it is futile to send any in the first place! People need to be manipulated through search engine optimization techniques to buy from you because they are too dumb to think for themselves and hate the direct, honest approach! NOT! ...And the ultimate reason for discouraging you from creating an opt-in list - If you are an email marketer you are spamming! Well I am here to tell you that nothing could be further from the truth! Although it is certainly true that the nature of email marketing has changed in the past year or two it is not at all a method of marketing that you should ignore. In fact, so many online business people have been dismissing email marketing as a method of promotion that the time is better than ever to adopt it as a marketing technique in order to undermine your competition that is busy fussing around with web 2.0, White Hat SEO and all sorts of distracting stuff. I put this book together partly out of a need to be help beginners understand how easy it is to get targeted traffic using an email list. It is straightforward, simple and above all TRUE! Pumping Out Your First Email List is also a good reference guide for more advanced marketers because as I wrote it, I realized I was culling the methods that dont work for me anymore from its pages. This is important because shortcuts to success in internet marketing are a dime a dozen. Why devote all of your time to a strategy that may or may not work when the advice in Pumping Out Your First Email List prevents you from making terrible newbie mistakes in the first place! The thing I find is that most beginners in the business forget that their own time and effort equals money. The beginner always has some kind of plan NOT to pay him or herself. This is a lose-lose mentality, not a prosperous one. If you use the strategies in Pumping Out Your First Email List you will do fantastically well in the paycheck department. You will get that business you need within a month or two and it will show up in your accumulated revenues too! However when you use shortcuts to success that are based on wishful thinking somehow or on part measure then you will simply not be as successful! You Wont Find a Better Way to Drive Free, Paying Targeted Traffic to Your Site Than By Building A Great Double Opt-In Email List! The Information in the eBook is right up to the minute in terms of being hot content and exposes the secrets of real marketing gurus who know as well as I do that a responsive email ist is crucial to your online success! Where to find the absolutely best free tool for maximizing your keywords. The answer may surprise you! How the experts use article marketing to bring hundreds of visitors per day to their websites. How to create a title for your article that makes your copy irresistible to click on! How to use the old fashioned newsletter in an email to get people interested in what you have to say or sell! ... and everything else you need to learn about how to optimize your emailing list! 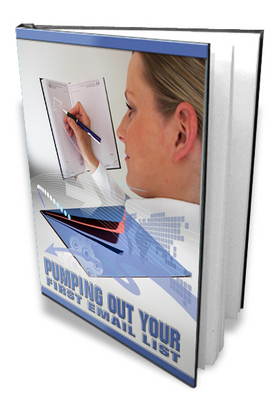 Pumping Out Your First Email List is over twelve thousand words in length and easy to follow. It is filled with strategies and tips that are helpful and not plagiarized from free information you can get anywhere on the internet. This does not mean that the wisdom of well known trusted gurus is ignored but I did my best to get rid of anything in this book that would detract from the simple clarity of telling you what you need to know to succeed at drawing traffic to your site. It will only take you just a few hours to create the website you need from WordPress, create a few squeeze pages and start building that email list. The eBook also includes many screenshots and step by step instructions that clearly and concisely tell you exactly what to do to achieve your goals.